Let see how you did! If you invested all 1720 CU in option 5 then... you chose poorly. Your profit is going to be 38.4 CU — not bad, but you can do better. If you invested 1020 in option 5 and 700 in option 4, that's a bit better at 39.5 CU, but still not optimal. What about 1020 in option 5, 500 in option 4 and 200 in option 2? That's actually a bit worse at 39.1 CU! I'll spare you the agony and reveal the best solution: 1020 in option 1, 300 in option 3 twice, and 100 in option 2, giving a profit of 40.5 CU. This is about 5.5% better than the straightforward solution of assigning everything to option 5. As this short exercise has hopefully exhibited, finding the optimal portofolio of options is far from trivial. Is there a way to programmatically find the optimal solution? First, let's define what are trying to find. A portofolio is a multiset of ( o,n ) pairs, each pair representing that we are assigning n CU to option o . For this solution to be acceptable, all the pairs need to be valid and the total sum of all pairs must not exceed the total amount of money we want to use. We are trying to find the portofolio which provides the maximum profit. To understand the solution space a bit more let's devise a way to enumerate all the portofolios, which is in fact not trivial. One way to think about this is that to produce a portofolio we first have to split our total amount in some way, and assign an option to each element in the split. Each such split is formally called a partition of n . The number of partitions for a number n is given by the partition function p ( n ) which becomes spectacular very quickly. For each such partition we also need to factor in all the different acceptable option permutations. Let's see if this problem has any interesting properties we can take advantage of to find the optimal solution more efficiently. We can thus get the best total value by using one of the members of the P n ( o,k ) set with the highest profit. Any other choice from that set would yield a lower total profit. We have thus shown that our problem exhibits the optimal substructure property: an optimal solution includes optimal solutions to subproblems. Another interesting thing to note is that to solve for n we need to solve for n − 1 .. . 1 . Similarly, to solve for n − 1 we need to solve for n − 2 .. . 1 and so on. We are solving the same problems over and over again! Our problem thus exhibits the property of overlapping subproblems. We can take advantage of this property by storing results in a cache and reusing them instead of recalculating them. Instances of this problem with a large n can still be prohibitive to solve even when using the dynamic programming approach I just described. Not all is lost, however, if we are willing to relax our requirement for a guaranteed optimal solution. One approach to cutting down our solution time, while still producing a possibly good solution, is to scale down our problem. We do this by dividing the start, end and bonus values of all options, and also the target number for which we solve for by a particular scale factor. Another way to view this is that scaling down by scale corresponds to performing the algorithms with a minimum step of value scale instead of value 1. When we find the optimal solution we can scale it back up using the same scale factor. The expectation is that the optimal solution for the scaled down version of our problem is going to be in the proximity of the optimal solution for the original version, and assuming that the Profit function is generally smooth, the profit is also going to be near the optimal one. Another approach to solving this problem faster is to explore whether there is greedy solution for it. Below I will describe an approach that works in many cases, but is not guaranteed to provide the optimal solution. Taking inspiration from the greedy solution to the fractional knapsack problem, at each step we greedily select to put as many CUs as possible in the option with the best marginal profit. The key observation here is that in our case each option has two different marginal profits. The first one involves investing in a new instance of an option using its minimum acceptable amount. The second one involves investing more in an instance of an option we have already invested in. In the first case the sign up bonus kicks in and increases the marginal profit. In the second case the marginal profit is simply the interest. For a total amount of 1720 this method works flawlessly. We first select to add ( o 5 , 1000) to our portofolio for a marginal profit of 2.4%. From the remaining 720 we add ( o 3 , 300) for a marginal profit of 2.333%. From the remaining 420 we again choose ( o 3 , 300) . We now have 120 left, for which we choose ( o 3 , 100) , and the final 20 we add to the ( o 5 , 1000) instance we already have. Unfortunately, this method doesn't find the optimal solution in all cases. Take for example a total amount of 500. The greedy algorithm chooses ( o 3 , 300) , ( o 2 , 100) , ( o 2 , 100) for a total profit of 11.2. Alas, the optimal solution is simply ( o 4 , 500) for a total profit of 11.4. Perhaps there is some other greedy approach that provides optimal solutions in all cases. Still, the described greedy approach is useful if we want to quickly get a possibly good solution. We could also try both the greedy approach and the scaling approach to raise our confidence level in the generated solution. We have mostly focused on solving our investment problem using a dynamic programming approach. Taking a step back, we may ask if this is indeed the best way to get an optimal solution. Can we approach this problem from a completely different angle to improve performance? It turns out that the answer is yes! With some creativity our problem can be expressed as an integer linear program (ILP), for which we have algorithms that work quite efficiently in practice. I plan to present this approach in more detail in a future post. If you want to try out the ideas mentioned in this post, I have created a program implementing all the algorithms and variations. You can find it at: https://github.com/afrantzis/invest. In the past week or so I've been bitten twice by failing to initialize member variables in a C++ class's constructor. So I went looking for compiler options, static analyzers, etc. to tell me when I fail to do this. So far I've found nothing that correctly reports to me that I forgot to add m_foobar initialization to my constructor. /Wall on msvc -Weff-c++, cppcheck, etc. all fail me here. Isn't there something out there that will say "Jeremy, you dork, you forgot to initialize m_startCount as 0, you'll get garbage" (sometimes and only on M$ Windows, but still) ? During the past two months Rob Herring and I have been working on a new driver for Midgard and Bifrost GPUs that could be accepted mainline. Arm already maintains a driver out of tree with an acceptable open source license, but it doesn't implement the DRM ABI and several design considerations make it unsuitable for inclusion in mainline Linux. The absence of a driver in mainline prevents users from keeping their kernels up-to-date and hurts integration with other parts of the free software stack. It also discourages SoC and BSP vendors from submitting their code to mainline, and hurts their ability to track mainline closely. Besides the code of the driver itself, there's one more condition for mainline inclusion: an open source implementation of the userspace library needs to exist, so other kernel contributors can help verifying, debugging and maintaining the kernel driver. It's an enormous pile of difficult work to reverse engineer the inner workings of a GPU and then implement a compiler and command submission infrastructure, so big thanks to Alyssa Rosenzweig for leading that effort. Most of the Panfrost code is already part of mainline Mesa, with the code that directly interacts with the new DRM driver being in the review stage. Currently targeted GPUs are T760 and T860, with the RK3399 being the SoC more often used for testing. The kernel driver is being developed in the open and though we are trying to follow the best practices as displayed by other DRM drivers, there's a number of tasks that need to be done before we consider it ready for submission. - Lots of cleanups and bug fixing! A while back the kerf plate on my chop saw got damaged. It’s not a well known make (at least, not to me, it’s a “Rexon M2500AE” that I got second hand), so sourcing a replacement wouldn’t be trivial. As time has gone on, it’s got more and more damaged, to the point that the saw is getting dangerous to use. So rather than use it in it’s increasingly dangerous state or replacing the saw, I decided to try and make a replacement on my 3D printer. As I previously announced, I’m organising a BSP in Bratislava during the weekend following FOSDEM. It will be happening at the same time as the BSP in Berlin, so if it’s not practical or possible for you to come to Berlin, consider coming around here. 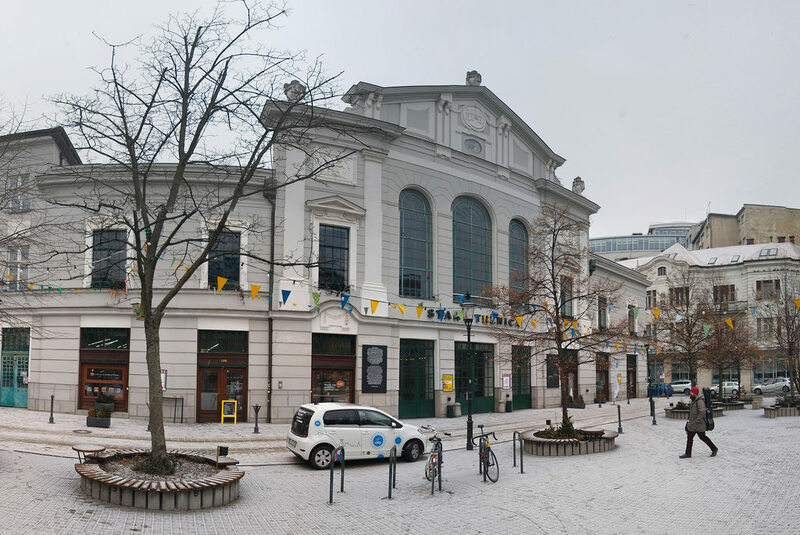 The venue this time is Lab.cafe, café/coworking space/maker space in the centre of Bratislava in the building of the old market hall. The venue located at the boundary of the Old Town, so while it is easily accessible by foot or public transport, it is a bit complicated to reach by car. If you’re not from Bratislava, you will likely be arriving by train (to the main station, Bratislava hl.st.) or bus/coach (to the bus station). From the train station, take tram number 1 to the stop Námestie SNP; the tram will stop in from of the market hall. If arriving by bus, it’s best to walk, but if you prefer buses, take either 205 or X72 to the final stop Nemocnica sv. Michala. If you’re coming from Vienna, both train and coach timetables are available from cp.sk, e.g. by using this link. If you decide you’d like to attend, please sign up here: https://framadate.org/debian-bsp-bratislava-2019-02. Please indicate the which days you can attend, and whether you will be attending in before the lunch time or after or both. For more up-to-date information, see the wiki page: https://wiki.debian.org/BSP/2019/02/sk/Bratislava. See you at the bug squashing party! resvg: worth having in Debian? One of the major differences from other rendering libraries is that resvg does a lot of preprocessing before rendering. It converts shapes to paths, resolves attributes, removes groups and invisible elements, fixes a lot of issues in malformed SVG files. Then it creates a simple render tree with all elements and attributes resolved. And only then it starts to render. So it's very easy to implement a new rendering backend. I’m thinking of packaging this for Debian, but I would be interested to know what others think of this. The Software Freedom Conservancy is having the last 7 days to collect the remaining less than $14 000 of the fundraiser generously matched by Private Internet Access. All donations up to $90 000 will be matched until 15 January. Conservancy is an organisation sponsoring nearly 50 free software projects helping them, most importantly with accounting, paying developers and defending their trademarks and ensuring license compliance. Read more about what the Conservancy does on their website. The matching funds expire soon, so if you can, please donate directly before 15 January. Below you can see glmark2 running as a Wayland client in Weston, on a NanoPC -T4 (so a RK3399 SoC with a Mali T-864 GPU)). It's much smoother than on the video, which is limited to 5FPS by the webcam. Weston is running with the DRM backend and the GL renderer. For more than 10 years, at Collabora we have been happily helping our customers to make the most of their hardware by running free software. One area some of us have specially enjoyed working on has been open drivers for GPUs, which for a long time have been considered the next frontier in the quest to have a full software platform that companies and individuals can understand, improve and fix without having to ask for permission first. Something that has saddened me a bit has been our reduced ability to help those customers that for one reason or another had chosen a hardware platform with ARM Mali GPUs, as no open driver was available for those. While our biggest customers were able to get a high level of support from the vendors in order to have the Mali graphics stack well integrated with the rest of their product, the smaller ones had a much harder time in achieving that level of integration, which manifested in reduced performance, increased power consumption and slipped milestones. That's why we have been following with great interest the several efforts that aimed to come up with an open driver for GPUs in the Mali family, one similar to those already existing for Qualcomm, NVIDIA and Vivante. At XDC last year we had the chance of meeting the people involved in the latest effort to develop such a driver: Panfrost. And in the months that followed I made some room in my backlog to come up with a plan to give the effort a boost. At that point, Panfrost was only able to get its bits in the screen by an elaborate hack that involved copying each frame into a X11 SHM buffer, which besides making the setup of the development environment much more cumbersome, invalidated any performance analysis. It also limited testing to demos such as glmark2. Due to my previous work on Etnaviv I was already familiar with the abstractions in Mesa for setups in which the display of buffers is performed by a device different from the GPU so it was just a matter of seeing how we could get the kernel driver for the Mali GPU to play well with the rest of the stack. So during the past month or so I have come up with a proper implementation of the winsys abstraction that makes use of ARM's kernel driver. The result is that now developers have a better base on which to work on the rendering side of things. By properly creating, exporting and importing buffers, we can now run applications on GBM, from demos such as kmscube and glmark2 to compositors such as Weston, but also big applications such as Kodi. We are also supporting zero-copy display of GPU-rendered clients in Weston. This should make it much easier to work on the rendering side of things, and work on a proper DRM driver in the mainline kernel can proceed in parallel. For those interested in joining to the effort, Alyssa has graciously taken the time to update the instructions to build and test Panfrost. You can join us at #panfrost in Freenode and can start sending merge requests to Gitlab. Thanks to Collabora for sponsoring this work and to Alyssa Rosenzweig and Lyude Paul for their previous work and for answering my questions. Hostapd and wpa-supplicant 2.7 have been in Debian experimental for some time already, with snapshots available since May 2018, and the official release since 3 December 2018. I’ve been using those 2.7 snapshots myself since May, but I do realise my x250 with an Intel Wi-Fi card is probably not the most representative example of hardware wpa-supplicant would often run on, so before I upload 2.7 to unstable, it would be great if more people tested it. So please try to install it from experimental and see if it works for your use cases. In the latest upload, I have enabled a bunch of new upstream features which previously didn’t exist or were still experimental, so it would be great to give them a go. This morning I have decided that this is the time. The time to finally remove the binary vconfig utility (which used to help people configure VLANs) from Debian. But fear not, the command isn’t going anywhere (yet), since almost six years ago I’ve written a shell script that replaces it, using ip(8) instead of the old and deprecated API. If you’re still using vconfig, please give it a test and consider moving to better, newer ways of configuring your VLANs. If you’re not sure whether you’re using it or not, mostly likely not only you aren’t, but it’s quite possible that you may not even need the vlan package that ships vconfig, since the most important functionality of it has since been implemented in ifupdown, networkd and NetworkManager. I’ve had a couple of domains for quite a few years now and have been hosting websites on them of some description since I got them. Over time my requirements and importantly the time, energy and enthusiasm I have available to maintain them has changed. I haven’t been a care-free uni student for well over a decade now and other interests and responsibilities now demand time I’d once happily devote to them. In an ideal world, everyone would implicitly understand that it just makes good business sense to upstream some of the modifications made when creating your Linux powered devices. However this is a long way from being common knowledge and is still something that a lot of managers that will need convincing that this infact in their best interests. Just so that we are clear, I’m not suggesting here that your next Linux powered device should be an entirely open design. GNOME GitLab has AWS runners, but they are used only when pushing code into a GNOME upstream repository, not when you push into your personal fork. For personal forks there is only one (AFAIK) shared runner and you could be waiting for hours before it picks your job. But did you know you can register your own PC, or a spare laptop collecting dust in a drawer, to get instant continuous integration (CI) going? It’s really easy to setup! You can repeat step 5 with the registration token of all your personal forks in the same GitLab instance. To make this easier, here’s a snippet I wrote in my ~/.bashrc to register my “builder.local” machine on a new project. Use it as gitlab-register . cmd="sudo gitlab-runner register --non-interactive --url $host --executor docker --docker-image fedora:27 --registration-token $token"
Not only will you now get faster CI, but you’ll also reduce the queue on the shared runner for others! In a previous post I discussed a few FOSS specific mentalities and practices that I believe play a role in discouraging adoption of comprehensive automated testing in FOSS. One of the points that came up in discussions, is whether the basic premise of the post, that FOSS projects don't typically employ comprehensive automated testing, including not having any tests at all, is actually true. That's a valid concern, given that the post was motivated by my long-term observations working on and with FOSS and didn't provide any further data. In this post will try to address this concern. The main question is how we can measure the comprehensiveness of a test suite. Code coverage is the standard metric used in the industry and makes intuitive sense. However, it presents some difficulties for large scale surveys, since it's not computationally cheap to produce and often requires per project changes or arrangements. I would like to propose and explore two alternative metrics that are easier to produce, and are therefore better suited to large scale surveys. The first metric is the test commit ratio of the codebase — the number of commits that affect test code as a percentage of all commits. Ideally, every change that adds a feature or fixes a bug in the production code should be accompanied by a corresponding change in the test code. The more we depart from this ideal, and, hence, the less often we update the test code, the less comprehensive our test suite tends to be. This metric is affected by the project's particular commit practices, so some amount of variance is expected even between projects considered to be well tested. The second metric is the test code size ratio of the codebase — the size of the test code as a percentage of the size of all the code. It makes sense intuitively that, typically, more test code will be able to test more production code. That being said, the size itself does not provide the whole picture. Depending on the project, a compact test suite may be adequately comprehensive, or, conversely, large test data files may skew this metric. Neither of these metrics is failproof, but my hypothesis is that when combined and aggregated over many projects they can provide a good indication about the overall trend of the comprehensiveness of test suites, which is the main goal of this post. Let's see what these metrics give us for FOSS projects. I chose two software suites that are considered quite prominent in the FOSS world, namely GNOME and KDE, which together consist of over 1500 projects. A small number of these projects are not good candidates for this survey, because, for example, they are empty, or are pure documentation. Although they are included in the survey, their count is low enough to not affect the overall trend reported below. The first thing to notice is the tall lines in the left part of both graphs. For the second graph this shows that a very large percentage of the projects, roughly 55%, have either no tests at all, or so few as to be practically non-existent. Another interesting observation is the position of the 80% percentile lines, which show that 80% of the projects have test commit ratios less than 11.2%, and test code size ratios less than 8.8%. In other words, out of ten commits that change the code base, only about one (or fewer) touches the tests in the majority of the projects. Although this doesn't constitute indisputable proof that tests are not comprehensive, it is nevertheless a big red flag, especially when combined with low test code size percentages. Each project may have different needs and development patterns, and these numbers need to be interpreted with care, but as a general trend this is not encouraging. On the bright side, there are some projects with higher values in this distribution. It's no surprise that this set consists mainly of core libraries from these software suites, but does not include many end-user applications. Going off on a slight tangent, one may argue that the distribution is unfairly skewed since many of these projects are GUI applications which, according to conventional wisdom, are not easy to test. However, this argument fails on multiple fronts. First, it's not unfair to include these programs, because we expect no less of them in terms of quality compared to other types of programs. They don't get a free pass because they have a GUI. In addition, being a GUI program is not a valid excuse for inadequate testing, because although testing the UI itself, or the functionality through the UI, may not be easy, there is typically a lot more we can test. Programs provide some core domain functionality, which we should be able to test independently if we decouple our core domain logic from the UI, often by using a different architecture, for example, the Hexagonal Architecture. This graph displays quite a diverse collection of projects including a database, graphics libraries, a GUI toolkit, a display compositor, system tools and even a GUI application. These projects are considered to be relatively well tested, each in its own particular way, so these higher numbers provide some evidence that the metrics correlate with test comprehensiveness. If we accept this correlation, this collection also shows that we can achieve more comprehensive testing in a wide variety of projects. Depending on project, the trade-offs we need to make will differ, but it is almost always possible to do well in this area. The interpretation of individual results varies with the project, but, in general, I have found that the test commit ratio is typically a more reliable indicator of test comprehensiveness, since it's less sensitive to test specifics compared to test code size ratio. In order to produce the data, I developed the git-test-annotate program which produces a list of files and commits from a git repository and marks them as related to testing or not. git-test-annotate decides whether a file is a test file by checking for the string "test" anywhere in the file's path within the repository. This is a very simple heurestic, but works surprisingly well. In order to make test code size calculation more meaningful, the tool ignores files that are not typically considered testable sources, for example, non-text files and translations, both in the production and the test code. For commit annotations, only mainline commits are taken into account, To check if a commit affects the tests the tool checks if it changes at least one file with "test" in its path. To get the stats for KDE and GNOME I downloaded all their projects from their github organizations/mirrors and ran the git-test-annotate tool on each project. All the annotated data and a python script to process them are available in the foss-test-annotations repository. I hope this post has provided some useful information about the utility of the proposed metrics, and some evidence that there is ample room for improvement in automated testing of FOSS projects. It would certainly be interesting to perform a more rigorous investigation to evaluate how well these metrics correlate with code coverage. Before closing, I would like to mention that there are cases where projects are primarily tested through external test suites. Examples in the FOSS world are the piglit suite for Mesa, and various tests suites for the Linux kernel. In such cases, project test comprehensiveness metrics don't provide the complete picture, since they don't take into account the external tests. These metrics are still useful though, because external suites typically perform functional or conformance testing only, and the metrics can provide information about internal testing, for example unit testing, done within the projects themselves. For the last month or so, I’ve been playing with a new project during my work at Collabora, and as I’ve already briefly talked about at XDC 2018, it’s about time to talk about it to a wider audience. Zink is an OpenGL implementation on top of Vulkan. Or to be a bit more specific, Zink is a Mesa Gallium driver that leverage the existing OpenGL implementation in Mesa to provide hardware accelerated OpenGL when only a Vulkan driver is available. Why implement OpenGL on top of Vulkan? I’ll go through each of these points in more detail below. But there’s another, less concrete reason; someone had to do this. I was waiting for someone else to do it before me, but nobody seemed to actually go ahead. At least as long as you don’t count solutions who only implement some variation of OpenGL ES (which in my opinion doesn’t solve the problem; we need full OpenGL for this to be really valuable). One problem is that OpenGL is a big API with a lot of legacy stuff that has accumulated since its initial release in 1992. OpenGL is well-established as a requirement for applications and desktop compositors. But since the very successful release of Vulkan, we now have two main-stream APIs for essentially the same hardware functionality. It’s not looking like neither OpenGL nor Vulkan is going away, and the software-world is now hard at work implementing Vulkan support everywhere, which is great. But this leads to complexity. So my hope is that we can simplify things here, by only require things like desktop compositors to support one API down the road. We’re not there yet, though; not all hardware has a Vulkan-driver, and some older hardware can’t even support it. But at some point in the not too far future, we’ll probably get there. This means there might be a future where OpenGL’s role could purely be one of legacy application compatibility. Perhaps Zink can help making that future a bit closer? The amount of drivers to maintain is only growing, and we want the amount of code to maintain for legacy hardware to be as little as possible. And since Vulkan is a requirement already, maybe we can get good enough performance through emulation? Besides, in the Open Source world, there’s even new drivers being written for old hardware, and if the hardware is capable of supporting Vulkan, it could make sense to only support Vulkan “natively”, and do OpenGL through Zink. It all comes down to the economics here. There aren’t infinite programmers out there that can maintain every GPU driver forever. But if we can make it easier and cheaper, maybe we can get better driver-support in the long run? Because Zink is implemented as a Gallium driver in Mesa, there’s some interesting side-benefits that comes “for free”. For instance, projects like Gallium Nine or Clover could in theory work on top of the i965 Vulkan driver through Zink. Please note that this hasn’t really been tested, though. It should also be possible to run Zink on top of a closed-source Vulkan driver, and still get proper window system integration. Not that I promote the idea of using a closed-source Vulkan driver. This might sound a bit strange, but it might be possible to extend Zink in ways where it can act as a cooperation-layer between OpenGL and Vulkan code in the same application. The thing is, big CAD applications etc won’t realistically rewrite all of their rendering-code to Vulkan in a wave of a hand. So if they can for instance prototype some Vulkan-code inside an OpenGL application, it might be easier to figure out if Vulkan is worth it or not for them. VK_KHR_maintenance1: This is required for the viewport flipping. It’s also possible to do without this extension, and we have some experimental patches for that. I would certainly love to require as few extensions as possible. VK_KHR_external_memory_fd: This is required as a way of getting the rendered result on screen. This isn’t technically a hard requirement, as we also have a copy-based approach, but that’s almost unusably slow. And I’m not sure if we’ll bother keeping it around. Zink has to my knowledge only been tested on Linux. I don’t think there’s any major reasons why it wouldn’t run on any other operating system supporting Vulkan, apart from the fact that some window-system integration code might have to be written. Right now, it’s not super-impressive: we implement OpenGL 2.1, and OpenGL ES 1.1 and 2.0 plus some extensions. Please note that the list of extensions might depend on the Vulkan implementation backing this, as we forward capabilities from that. The list of extensions is too long to include here in a sane way, but here’s a link to the output of glxinfo as of today on top of i965. glPointSize() is currently not supported. Writing to gl_PointSize from the vertex shader does work. We need to write some code to plumb this through the vertex shader to make it work. Texture borders are currently always black. This will also need some emulation code, due to Vulkan’s lack of arbitrary border-color support. Since a lot of hardware actually support this, perhaps we can introduce some extension to add it back to the API? No control-flow is supported in the shaders at the moment. This is just because of lacking implementation for those opcodes. It’s coming. No GL_ALPHA_TEST support yet. There’s some support code in NIR for this, we just need to start using it. This will depend on control-flow, though. glShadeModel(GL_FLAT) isn’t supported yet. This isn’t particularly hard or anything, but we currently emit the SPIR-V before knowing the drawing-state. We should probably change this. Another alternative is to patch in a flat-decoration on the fly. Different settings for glPolygonMode(GL_FRONT, ...) and glPolygonMode(GL_BACK, ...). This one is tricky to do correct, at least if we want to support newer shader-stages like geometry and tessellation at the same time. It’s also hard to do performant, even without these shader-stages, as we need to draw these primitives in the same order as they were specified but with different primitive types. Luckily, Vulkan can do pretty fast geometry submission, so there might be some hope for some compromise-solution, at least. It might also be possible to combine stream-out and a geometry-shader or something here if we really end up caring about this use-case. And most importantly, we are not a conformant OpenGL implementation. I’m not saying we will never be, but as it currently stands, we do not do conformance testing, and as such we neither submit conformance results to Khronos. What’s the performance-hit compared to a “native” OpenGL driver? One thing should be very clear; a “native” OpenGL driver will always have a better performance-potential, simply because anything clever we do, they can do as well. So I don’t expect to beat any serious OpenGL drivers on performance any time soon. But the performance loss is already kinda less than I feared, especially since we haven’t done anything particularly fancy with performance yet. But OK, I will say this: I currently get around 475 FPS on glxgears on top of Zink on my system. The i965 driver gives me around 1750 FPS. Don’t read too much into those results, though; glxgears isn’t a good benchmark. But for that particular workload, we’re about a quarter of the performance. As I said, I don’t think glxgears is a very good benchmark, but it’s the only thing somewhat reproducible that I’ve run so far, so it’s the only numbers I have. I’ll certainly be doing some proper benchmarking in the future. In the end, I suspect that the pipeline-caching is going to be the big hot-spot. There’s a lot of state to hash, and finally compare once a hit has been found. We have some decent ideas on how to speed it up, but there’s probably going to be some point where we simply can’t get it any better. All in all, I’m not too worried about this yet. We’re still early in the project, and I don’t see any major, impenetrable walls. Zink is only available as source code at the moment. No distro-packages exits yet. The code currently lives in the zink-branch in my Mesa fork. The first thing you have to do, is to clone the repository and build the zink-branch. Even though Mesa has an autotools build-system, Zink only supports the Meson build-system. Remember to enable the zink gallium-driver (-Dgallium-drivers=zink) when configuring the build. Install the driver somewhere appropriate, and use the $MESA_LOADER_DRIVER_OVERRIDE environment variable to force the zink-driver. From here you should be able to run many OpenGL applications using Zink. Checking out files: 100% (5982/5982), done. Branch 'zink' set up to track remote branch 'zink' from 'origin'. Currently, the development happens on #dri-devel on Freenode. Ping me (my handle is kusma) with a link your branch, and I’ll take a look. Well, I think “forwards” is the only way to move :wink:. I’m currently working 1-2 days per week on this at Collabora, so things will keep moving forward on my end. In addition, Dave Airlie seems to have a high momentum at the moment also. He has a work-in-progress branch that hints at GL 3.3 being around the corner! I also don’t think there’s any fundamental reason why we shouldn’t be able to get to full OpenGL 4.6 eventually. Besides the features, I also want to try to get this upstream in Mesa in some not-too-distant future. I think we’re already beyond the point where Zink is useful. I also would like to point out that David Airlie of RedHat has contributed a lot of great patches, greatly advancing Zink from what it was before his help! At this point, he has implemented at least as many features as I have. So this is very much his accomplishment as well. Almost all of Collabora's customers use the Linux kernel on their products. Often they will use the exact code as delivered by the SBC vendors and we'll work with them in other parts of their software stack. But it's becoming increasingly common for our customers to adapt the kernel sources to the specific needs of their particular products. A very big problem most of them have is that the kernel version they based on isn't getting security updates any more because it's already several years old. And the reason why companies are shipping kernels so old is that they have been so heavily modified compared to the upstream versions, that rebasing their trees on top of newer mainline releases is so expensive that is very hard to budget and plan for it. To avoid that, we always recommend our customers to stay close to their upstreams, which implies rebasing often on top of new releases (typically LTS releases, with long term support). For the budgeting of that work to become possible, the size of the delta between mainline and downstream sources needs to be manageable, which is why we recommend contributing back any changes that aren't strictly specific to their products. But even for those few companies that already have processes in place for upstreaming their changes and are rebasing regularly on top of new LTS releases, keeping up with mainline can be a substantial disruption of their production schedules. This is in part because new bugs will be in the new mainline release, and new bugs will be in the downstream changes as they get applied to the new version. Those companies that are already keeping close to their upstreams typically have advanced QA infrastructure that will detect those bugs long before production, but a long stabilization phase after every rebase can significantly slow product development. To improve this situation and encourage more companies to keep their efforts close to upstream we at Collabora have been working for a few years already in continuous integration of FOSS components across a diverse array of hardware. The initial work was sponsored by Bosch for one of their automotive projects, and since the start of 2016 Google has been sponsoring work on continuous integration of the mainline kernel. One of the major efforts to continuously integrate the mainline Linux kernel codebase is kernelci.org, which builds several configurations of different trees and submits boot jobs to several labs around the world, collating the results. This is being of great help already in detecting at a very early stage any changes that either break the builds, or prevent a specific piece of hardware from completing the boot stage. Though kernelci.org can easily detect when an update to a source code repository has introduced a bug, such updates can have several dozens of new commits, and without knowing which specific commit introduced the bug, we cannot identify culprits to notify of the problem. This means that either someone needs to monitor the dashboard for problems, or email notifications are sent to the owners of the repositories who then have to manually look for suspicious commits before getting in contact with their author. To address this limitation, Google has asked us to look into improving the existing code for automatic bisection so it can be used right away when a regression is detected, so the possible culprits are notified right away without any manual intervention. Another area in which kernelci.org is currently lacking is in the coverage of the testing. Build and boot regressions are very annoying for developers because they impact negatively everybody who work in the affected configurations and hardware, but the consequences of regressions in peripheral support or other subsystems that aren't involved critically during boot can still make rebases much costlier. At Collabora we have had a strong interest in having the DRM subsystem under continuous integration and some time ago started a R&D project for making the test suite in IGT generically useful for all the DRM drivers. IGT started out being i915-specific, but as most of the tests exercise the generic DRM ABI, they could as well test other drivers with a moderate amount of effort. Early in 2016 Google started sponsoring this work and as of today submitters of new drivers are using it to validate their code. Another related effort has been the addition to DRM of a generic ABI for retrieving CRCs of frames from different components in the graphics pipeline, so two frames can be compared when we know that they should match. And another one is adding support to IGT for the Chamelium board, which can simulate several display connections and hotplug events. A side-effect of having continuous integration of changes in mainline is that when downstreams are sending back changes to reduce their delta, the risk of introducing regressions is much smaller and their contributions can be accepted faster and with less effort. We believe that improved QA of FOSS components will expand the base of companies that can benefit from involvement in development upstream and are very excited by the changes that this will bring to the industry. If you are an engineer who cares about QA and FOSS, and would like to work with us on projects such as kernelci.org, LAVA, IGT and Chamelium, get in touch! A few times in the recent past I've been in the unfortunate position of using a prominent Free and Open Source Software (FOSS) program or library, and running into issues of such fundamental nature that made me wonder how those issues even made it into a release. In all cases, the answer came quickly when I realized that, invariably, the project involved either didn't have a test suite, or, if it did have one, it was not adequately comprehensive. I am using the term comprehensive in a very practical, non extreme way. I understand that it's often not feasible to test every possible scenario and interaction, but, at the very least, a decent test suite should ensure that under typical circumstances the code delivers all the functionality it promises to. For projects of any value and significance, having such a comprehensive automated test suite is nowadays considered a standard software engineering practice. Why, then, don't we see more prominent FOSS projects employing this practice, or, when they do, why is it often employed poorly? In this post I will highlight some of the reasons that I believe play a role in the low adoption of proper automated testing in FOSS projects, and argue why these reasons may be misguided. I will focus on topics that are especially relevant from a FOSS perspective, omitting considerations, which, although important, are not particular to FOSS. My hope is that by shedding some light on this topic, more FOSS projects will consider employing an automated test suite. As you can imagine, I am a strong proponent of automating testing, but this doesn't mean I consider it a silver bullet. I do believe, however, that it is an indispensable tool in the software engineering toolbox, which should only be forsaken after careful consideration. Most FOSS projects, at least those not supported by some commercial entity, don't come with any warranty; it's even stated in the various licenses! The lack of any formal obligations makes it relatively inexpensive, both in terms of time and money, to have the occasional bug in the codebase. This means that there are fewer incentives for the developer to spend extra resources to try to safeguard against bugs. When bugs come up, the developers can decide at their own leisure if and when to fix them and when to release the fixed version. Easy! At first sight, this may seem like a reasonably pragmatic attitude to have. After all, if fixing bugs is so cheap, is it worth spending extra resources trying to prevent them? Unfortunately, bugs are only cheap for the developer, not for the users who may depend on the project for important tasks. Users expect the code to work properly and can get frustrated or disappointed if this is not the case, regardless of whether there is any formal warranty. This is even more pronounced when security concerns are involved, for which the cost to users can be devastating. Of course, lack of formal obligations doesn't mean that there is no driver for quality in FOSS projects. On the contrary, there is an exceptionally strong driver: professional pride. In FOSS projects the developers are in the spotlight and no (decent) developer wants to be associated with a low quality, bug infested codebase. It's just that, due to the mentality stated above, in many FOSS projects the trade-offs developers make seem to favor a reactive rather than proactive attitude. One of the development practices FOSS projects employ ardently is code reviews. Code reviews happen naturally in FOSS projects, even in small ones, since most contributors don't have commit access to the code repository and the original author has to approve any contributions. In larger projects there are often more structured procedures which involve sending patches to a mailing list or to a dedicated reviewing platform. Unfortunately, in some projects the trust on code reviews is so great, that other practices, like automated testing, are forsaken. There is no question that code reviews are one of the best ways to maintain and improve the quality of a codebase. They can help ensure that code is designed properly, it is aligned with the overall architecture and furthers the long term goals of the project. They also help catch bugs, but only some of them, some of the time! The main problem with code reviews is that we, the reviewers, are only human. We humans are great at creative thought, but we are also great at overlooking things, occasionally filling in the gaps with our own unicorns-and-rainbows inspired reality. Another reason is that we tend to focus more on the code changes at a local level, and less on how the code changes affect the system as a whole. This is not an inherent problem with the process itself but rather a limitation of humans performing the process. When a codebase gets large enough, it's difficult for our brains to keep all the possible states and code paths in mind and check them mentally, even in a codebase that is properly designed. In theory, the problem of human limitations is offset by the open nature of the code. We even have the so called Linus's law which states that "given enough eyeballs, all bugs are shallow". Note the clever use of the indeterminate term "enough". How many are enough? How about the qualitative aspects of the "eyeballs"? The reality is that most contributions to big, successful FOSS projects are reviewed on average by a couple of people. Some projects are better, most are worse, but in no case does being FOSS magically lead to a large number of reviewers tirelessly checking code contributions. This limit in the number of reviewers also limits the extent to which code reviews can stand as the only process to ensure quality. In order to try out a development process in a project, developers first need to learn about it and be convinced that it will be beneficial. Although there are many resources, like books and articles, arguing in favor of automated tests, the main driver for trying new processes is still learning about them from more experienced developers when working on a project. In the FOSS world this also takes the form of studying what other projects, especially the high-profile ones, are doing. Since comprehensive automated testing is not the norm in FOSS, this creates a negative network effect. Why should you bother doing automated tests if the high profile projects, which you consider to be role models, don't do it properly or at all? Thankfully, the culture is beginning to shift, especially in projects using technologies in which automated testing is part of the culture of the technologies themselves. Unfortunately, many of the system-level and middleware FOSS projects are still living in the non automated test world. Tests as an afterthought is not a situation particular to FOSS projects, but it is especially relevant to them since the way they spring and grow can disincentivize the early writing of tests. Some FOSS projects start as small projects to scratch an itch, without any plans for significant growth or adoption, so the incentives to have tests at this stage are limited. In addition, many projects, even the ones that start with more lofty adoption goals, follow a "release early, release often" mentality. This mentality has some benefits, but at the early stages also carries the risk of placing the focus exclusively on making the project as relevant to the public as possible, as quickly as possible. From such a perspective, spending the probably limited resources on tests instead of features seems like a bad use of developer time. As the project grows and becomes more complex, however, more and more opportunities for bugs arise. At this point, some projects realize that adding a test suite would be beneficial for maintaining quality in the long term. Unfortunately, for many projects, it's already too late. The code by now has become test-unfriendly and significant effort is needed to change it. The final effect is that many projects remain without an automated test suite, or, in the best case, with a poor one. Automated testing delivers the most value if it is combined with a CI service that runs the tests automatically for each commit or merge proposal. Until recently, access to such services was difficult to get for a reasonably low effort and cost. Developers either had to set up and host CI themselves, or pay for a commercial service, thus requiring resources which unsponsored FOSS projects were unlikely to be able to afford. Nowadays, it's far easier to find and use free CI services, with most major code hosting platforms supporting them. Hopefully, with time, this reason will completely cease being a factor in the lack of automated testing adoption. The FOSS movement originated from the hacker culture and still has strong ties to it. In the minds of some, the processes around software testing are too enterprise-y, too 9-to-5, perceived as completely contrary to the creative and playful nature of hacking. My argument against this line of thought is that the hacker values technical excellence very highly, and, automated testing, as a tool that helps achieve such excellence, can not be inconsistent with the hacker way. Some pseudo-hackers may also argue that their skills are so refined that their code doesn't require testing. When we are talking about a codebase of any significant size, I consider this attitude to be a sign of inexperience and immaturity rather than a testament of superior skills. I hope this post will serve as a good starting point for a discussion about the reasons which discourage FOSS projects from adopting a comprehensive automated test suite. Identifying both valid concerns and misconceptions is the first step in convincing both fledging and mature FOSS projects to embrace automated testing, which will hopefully lead to an improvement in the overall quality of FOSS. MicroDebConf Brasília 2018 took place at Gama campus of University of Brasília on September 8th. It was amazing, we gathered a lot of students from university and some high schools, and some free software enthisiastics too. We had 44 attendees in total, we did not expect all these people in the begining! During the day we presented to them what is Debian Project and the many different ways to contribute to it. Since our focus was newcommers we started from the begining explaining how to use Debian properly, how to interact with the community and how to contribute. We also introduced them to some other subjects such as management of PGP keys, network setup with Debian and some topics about Linux kernel contributions. As you probably know, students are never satisfied, sometimes the talks are too easy and basic and other times are too hard and complex to follow. Then we decided to balance the talks level, we started from Debian basics and went over details of Linux kernel implementation. Their feedback was positive, so I think that we should do it again, atract students is always a challenge. In the end of the day we had some discussions regarding what should we do to grow our local community? We want more local people actually contributing to free software projects and specially Debian. A lot of people were interested but some of them said that they need some guidance, the life of a newcommer is not so easy for now. After some discussion we came up with the idea of a study group about Debian packaging, we will schedule meetings every week (or two weeks, not decided yet), and during these meetings we will present about packaging (good practices, tooling and anything that people need) and do some hands-on work. My intention is document everything that we will do to facilitate the life of future newcommers that wants to do Debian packaging. My main reference for this study groups has been LKCamp, they are a more consolidated group and their focus is to help people start contributing to Linux kernel. In my opinion, this kind of initiative could help us on bring new blood to the project and disseminate the free software ideas/culture. Other idea that we have is to promote Debian and free software in general to non technical people. We realized that we need to reach these people if we want a broader community, we do not know how exactly yet but it is in our radar. After all these talks and discussions we needed some time to relax, and we did that together! We went to a bar and got some beer (except people with less than 18 years old :) and food. Of course that ours discussions about free software kept running all night long. Last but not least, I would like to thank LAPPIS (a research lab which I was part in my undergrad), they helped us with all the logistics and buroucracies, and Collabora for the coffee break sponsorship! Collabora, LAPPIS and us share the same goal: promote FLOSS to all these young people and make our commuity grow! It appears today marks my 3 year anniversary at Collabora. It was quite a departure from my previous role in many ways, Collabora actively encourage it’s employees to work with and the Open Source community, contribute to open source projects, speak at and attend conferences. I work pretty much exclusively from home rather than from an office. It’s a genuine privilege to be able to help other businesses take advantage of open source software, whilst also guiding them on how to do this in a way that maximises the benefit to both them and the open source community. A long time ago, on a computer far, far away... well, actually, 14 years ago, on a computer that is still around somewhere in the basement, I wrote the first lines of source code for what would become the Bless hex editor. For my initial experiments I used C++ with the gtkmm bindings, but C++ compilation times were so appallingly slow on my feeble computer, that I decided to give the relatively young Mono framework a try. The development experience was much better, so I continued with Mono and Gtk#. For revision control, I started out with tla (remember that? ), but eventually settled on bzr. Development continued at a steady pace until 2009, when life's responsibilities got in the way, and left me with little time to work on the project. A few attempts were made by other people to revive Bless after that, but, unfortunately, they also seem to have stagnated. The project had been inactive for almost 8 years when the gna.org hosting site closed down in 2017 and pulled the official Bless page and bzr repository with it into the abyss. Despite the lack of development and maintenance, Bless remained surprisingly functional through the years. I, and many others it seems, have kept using it, and, naturally, a few bugs have been uncovered during this time. I recently found some time to bring the project back to life, although, I should warn, this does not imply any intention to resume feature development on it. My free time is still scarce, so the best I can do is try to maintain it and accept contributions. The project's new official home is at https://github.com/afrantzis/bless. To mark the start of this new era, I have released Bless 0.6.1, containing fixes for many of the major issues I could find reports for. Enjoy! Searching for this backtrace you can find various reports of other Mono programs also affected by this bug. At the time of writing, the mono packages in Debian and Ubuntu (4.6.2) exhibit this problem. If you are affected, the solution is to update to a newer version of Mono, e.g., from https://www.mono-project.com/download/stable/. There are two main options to handle reviews in git. The first option is to treat commits as the unit of review. In this commit-based flow, authors work on a branch with multiple commits and submit them for review, either by pushing the branch or by creating a patch series for these commits. Typically, each commit is expected to be functional and to be reviewable independently. The second option is to treat branches as the unit of review. In this branch-based flow, authors work on multiple dependent branches and submit them for review by pushing them to the review system. The individual commits in each branch don't matter; only the final state of each branch is taken into account. Some review systems call this the "squash" mode. Some people prefer to work this way, so they can update their submission without losing the history of each individual change (e.g., keep both D and D'). This reason is unconvincing, however, since one can easily preserve history in a commit-based flow, too, by checking out a different branch (e.g., 'feature-v2') to work on. Personally, I find branch-based flows a pain to work with. Their main fault is the distracting and annoying user experience when dealing with multiple dependent changes. Setting up and maintaining the dependent branches during updates is far from straightforward. What would normally be a simple 'git rebase -i', now turns into a fight to create and maintain separate dependent branches. There are tools that can help (git-rebase-update), but they are no match for the simplicity and efficiency of rebasing interactively in a single branch. I wrote the git-c2b (commits-to-branches) tool to be able to maintain a commit-based git flow even when working with branch-based review systems, such as Chromium's Gerrit. The idea, and the tool itself, is simple but effective. It allows me to work as usual in a single branch, splitting changes into commits and amending them as I like. Just before submitting, I run git-c2b to produce separate dependent branches for each commit. If the branches already exist they are updated without losing any upstream metadata. # feature-3 from the first commit, feature-4 from the second and so on. Although the main driver for implementing git-c2b was improving my Chromium workflow, there is nothing Chromium-specific about this tool. It can be used as a general solution to create dependent branches from commits in any branch. Enjoy! As the maintainer of GNU indent, I have just released version 2.2.12 (signature), the first release GNU indent saw in eight years. C99 and C11 keywords and typeof are now recognised. -linux preset now includes -nbs. -kr preset now includes -par. You might have heard of the Google Chromebook laptops. They come with Chrome OS, to run applications in the Chrome web browser such as Gmail, YouTube, Google Docs, Google Drive etc... Chromium OS is the open-source project behind Chrome OS, based on Linux (Gentoo). As part of the effort to keep the mainline Linux kernel working on these devices, they are being continuously tested on kernelci.org. kernelci.org is a project dedicated to testing the mainline Linux kernel in order to find issues introduced during its development. It uses LAVA to run tests on a variety of platforms in many different test labs as explained on the kernelci.org wiki. I've been enabling several Chromebooks to be tested on kernelci.org as part of my work at Collabora. There are quite a few steps to go through in order to be able to achieve this, so let's start from the beginning. It can be difficult to find a Servo debug board, but there are alternatives. Its PCB design is open source so you can in principle get one made. Some Servo boards will only work with Chromebook devices that have a special debug connector fitted on the motherboard. Newer Chromebooks can apparently be used with USB Type-C debug interfaces, although I haven't tried to do this myself. The part about LAVA automation is useful for continuous testing, but for kernel development it can be easier to configure the device to load a kernel image from a fixed network location and have direct console interaction. The first part about Depthcharge with tftpboot is relevant in this case. The part of Chrome OS that loads the Linux kernel and starts the device is called Depthcharge (source code). It's a payload for the Coreboot bootloader. So the ideal way to boot a Chromebook is to use Depthcharge. For development and testing, it can download a Linux kernel image over the network (TFTP) by enabling a debug command line. This is how LAVA controls Chromebooks, an example of which can be seen in Collabora's LAVA lab. The first step is to rebuild Depthcharge with the debug command line interface enabled, in order to be able to dynamically download a Linux kernel image using TFTP and boot it. Don't build all of Chromium OS! You can, but it's very large and we're only interested in the bootloader part here. Find out the code name for the device you have as per the developer information page. Enter the source code tree and build the firmware for your device. The "USE=fwconsole" option enables the console in Depthcharge. Once the build is complete (or a compatible binary has been downloaded) the firmware can be flashed onto the device. Each device type requires a slightly different flashing method, so here's an example for the same "gru-kevin" device: flash-kevin.sh. It will first read the current firmware and save it in a file, to be able to restore it later on if there was any problem with the new firmware. This can now all be automated in LAVA. Some device types such as the "gru-kevin", "veyron-jaq" and "nyan-big" are part of the mainline LAVA releases, so relatively little configuration is required for them. Installing LAVA and managing devices in a lab is a whole topic which goes beyond what this blog post is about; a good place to start is the LAVA documentation. In order to be able to use dut-control without a Chrome OS build environment, and to automatically bring up the device connections, servod-tools can be used in conjunction with hdctools. Installing and using these still requires a fair amount of manual configuration, which could be a topic for a future blog post. Now that the basic infrastructure to run tests is available, we're working on adding many more functional tests to cover various areas of the Linux kernel via user-space APIs - but that's for another blog post. remote: Counting objects: 234, done. remote: Compressing objects: 100% (233/233), done. Receiving objects: 100% (234/234), 53.20 KiB | 939.00 KiB/s, done. Resolving deltas: 100% (177/177), completed with 36 local objects. The idea here is that we by issuing a single short command can fetch the latest master branch from the upstream repository of the codebase we're working on and set our local master branch to point to the most recent upstream/master one. This works by looking for a remote called upstream (or falling back to origin if it isn't found). And resetting the local master branch to point at the upstream/master branch. Add this snippet under the [alias] section of your ~/.gitconfig file. If you have a closer look, you'll notice that the upstream remote is used if has been added, otherwise the origin remote is used. This selection is done using git running a shell script. This is what git ru might look like when used. This post has been a part of work undertaken by my employer Collabora. And thanks @widawsky for pointing out some improvements. 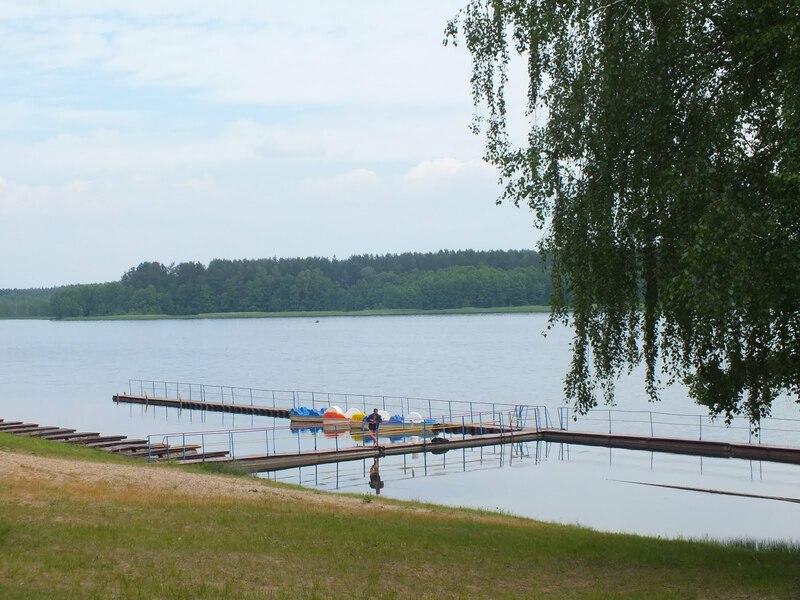 On Friday, I will be attending LVEE (Linux Vacation Eastern Europe) once again after a few years of missing it for various reasons. I will be presenting a talk on my experience of working with LAVA; the talk is based on a talk given by my colleague Guillaume Tucker, who helped me a lot when I was ramping up on LAVA. Since the conference is not well known outside, well, a part of Eastern Europe, I decided I need to write a bit on it. 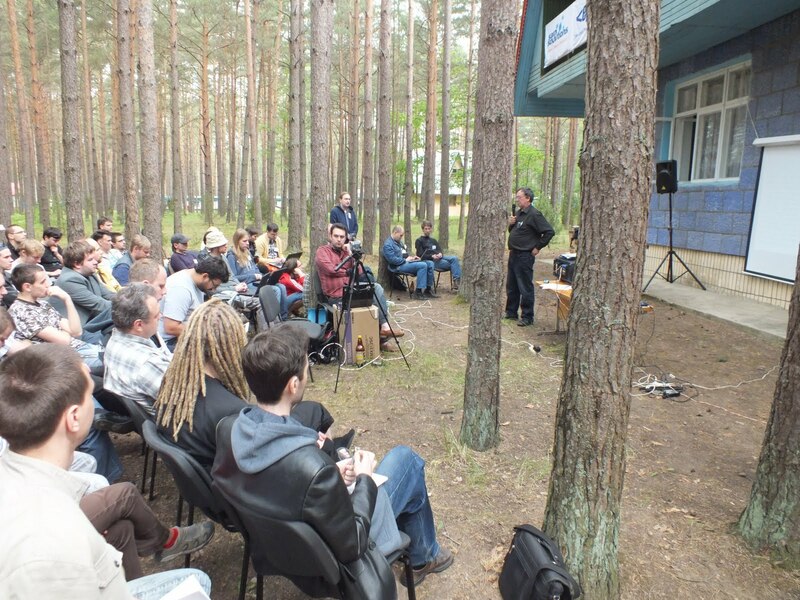 According to the organisers, they had the idea of having a Linux conference after the newly reborn Minsk Linux User Group organised quite a successful celebration of the ten years anniversary of Debian, and they wanted to have even a bigger event. 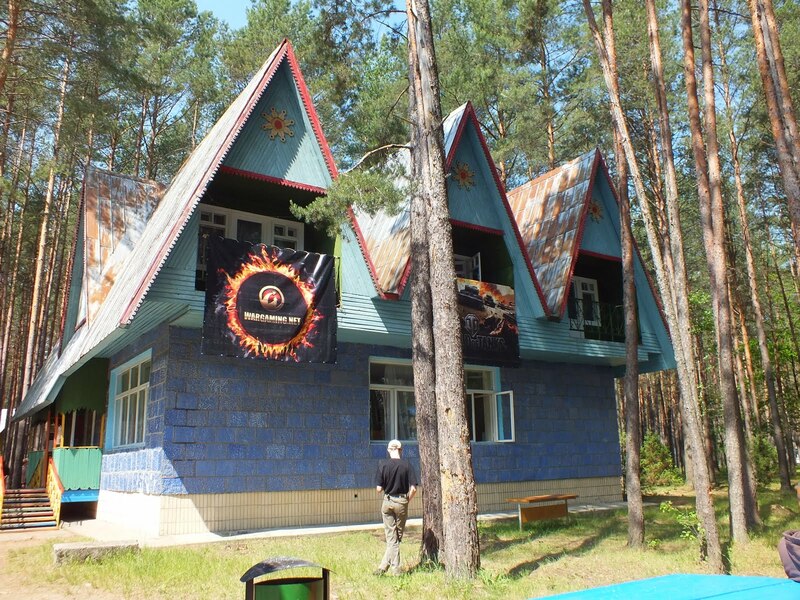 The first LVEE took place in 2005 in a middle of a forest near Hrodna. As the name suggests, this conference is quite different from many other conferences, and it is actually a bit close in spirit to the Linux Bier Wanderung. 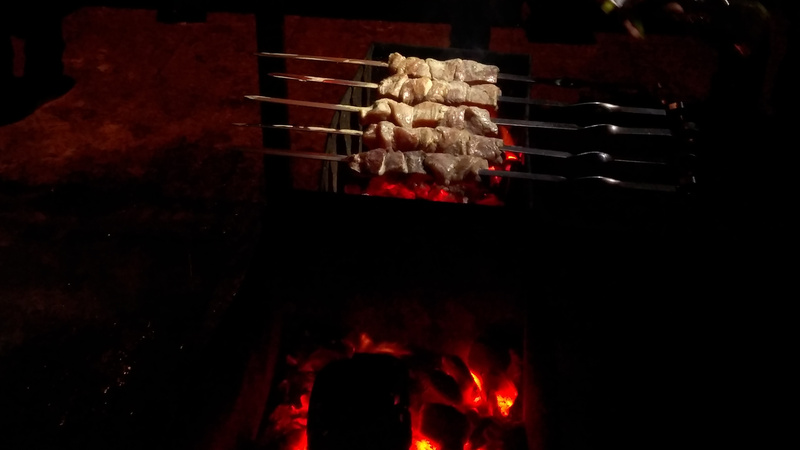 The conference is very informal, it happens basically in a middle of nowhere (until 2010, the Internet connection was very slow and unreliable or absent), and there’s a massive evening programme every evening with beer, shashlyk and a lot of chatting. My first LVEE was in 2009, and it was, in fact, my first Linux conference. 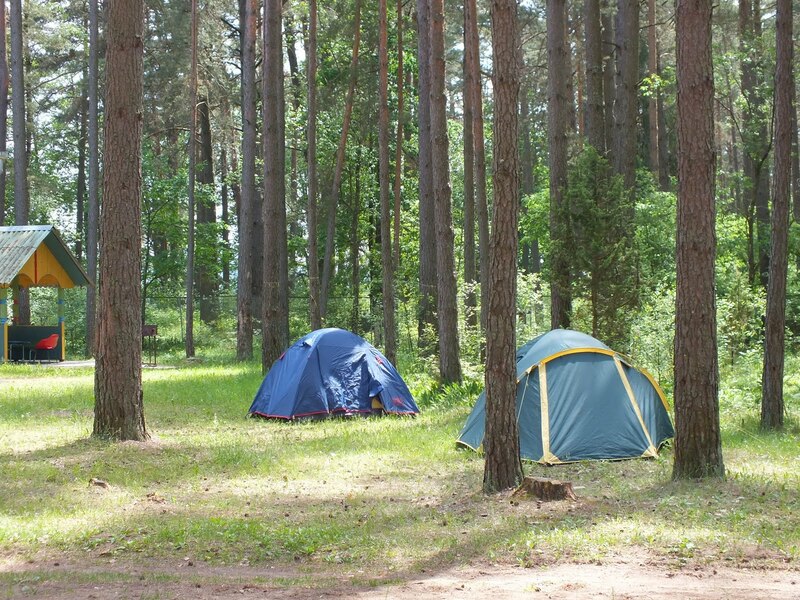 The venue for LVEE has traditionally been a tourist camp in a forest. 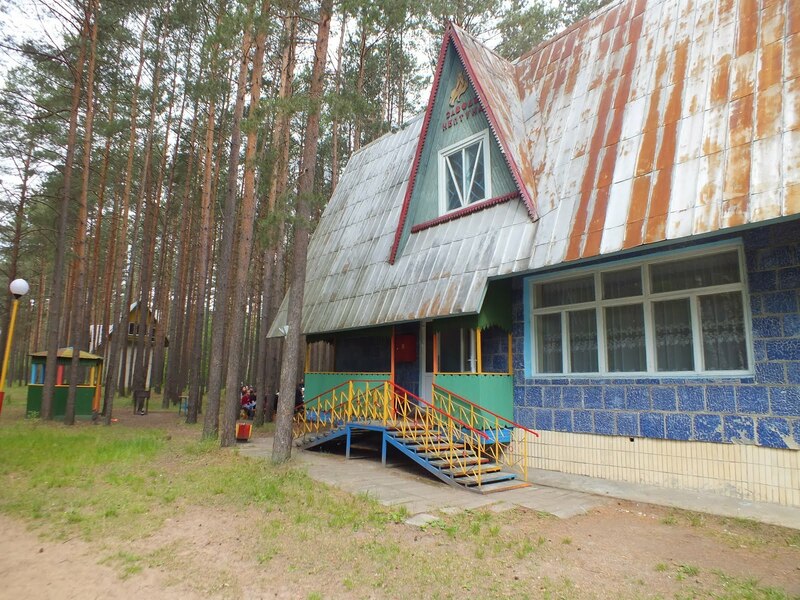 For those unfamiliar with the concept, a tourist camp (at least in the post-Soviet countries) is an accommodation facility usually providing a bare minimum comfort; people are normally staying in huts or small houses with shared facilities, often located outside. When the weather permits (which usually is defined as: not raining), talks are usually held outside. When it starts raining, they move inside one of the houses which is big enough to accommodate most of the people interested in talks. And, on the final day of the conference, cake! This year, for the first time LVEE is being sponsored by Collabora and Red Hat. The talks are usually in Russian (with slides usually being in English), but even if you don’t speak Russian and want to attend, fear not: most of the participants speak English to some degree, so you will unlikely feel isolated. If enough English-speaking participants sign up, it is possible that we can organise some aids (e.g. translated subtitles) to make both people not speaking English and not speaking Russian feel at home. It’s no secret that I’ve long advocated open source software. It’s something that I’ve been quite passionate about for something like 18 years now. So much so that I have literally made working with open source software and helping others benefit from using it my job, thanks to my employer Collabora. Like all software, open source software isn’t without it’s bugs and issues. If someone tells you that there are no bugs in their software, they are either clueless, lying or disingenuously talking about some very, very trivial application (and even then possibly still fall into one of the previous 2 categories). Come as no surprise, Debcamp and Debconf 18 were amazing! I worked on many things that I had not had enough time to accomplish before; also I had the opportunity to meet old friends and new people. Finally, I engaged in important discussions regarding the Debian project. Based on my last blog post, follows what I did in Hsinchu during these days. The Debconf 19 website has an initial version running \o/ I want to thank Valessio Brito and Arthur Del Esposte for helping me build this first version, and also thank tumblingweed for your explanation about how wafer works. The Perl Team Rolling Sprint was really nice! Four people participated, and we were able to get a bunch of things done, you can see the full report here. I worked on some Ruby packages. I uploaded some new dependencies of Rails 5 to unstable (which Praveen et al. were already working on them). I hope we can make Rails 5 package available in experimental soon, and ship it in the next Debian stable release. I also discussed about Redmine package with Duck (Redmine’s co-maintainer) but did not manage to work on it. See you all next year in Curitiba! In the Fuse Open post, I mentioned that I would no longer be working at Fuse. I didn’t mention what I was going to do next, and now that it’s been a while I guess it’s time to let the cat out of the bag: I’ve started working at Collabora. Collabora is an Open Source consultancy, specializing in a few industries. Most of what Collabora does is centered around things like Linux, automotive, embedded systems, and multimedia. You can read more about Collabora here. The word “consultant” brings out quite a lot of stereotypes in my mind. Luckily, we’re not that kind of consultants. I haven’t worn a tie a single day at work yet! I’m hired as a Principal Engineer on the Graphics team. This obviously means I’ll be working on graphics technology. So far, I’ve been working a bit on some R&D tasks about Vulkan, but mostly on Virgil 3D (“VirGL”). If you don’t know what VirGL is, the very short explanation is that it’s GPU virtualization for virtual machines. I’ve been working on adding/fixing support for OpenGL 4.3 as well as OpenGL ES 3.1. The work isn’t complete but it’s getting close, and patches are being upstreamed as I write this. I’m also working on Mesa. Currently mostly through Virgil, probably through other projects in the future as well. Apart from that, things depend heavily on customer needs. A big change from my previous jobs, is that I now work from home Instead of a shared office with my coworkers. This is because Collabora doesn’t have an Oslo office, as it’s largely a distributed team. Jokes aside, if this turns out to be a problem in the long term, I’ll look into getting a desk at some co-working space. There’s tons of them nearby. Another effect of Collabora not having an Oslo office means that I have to formally work as a contractor. This is mostly a formality (Collabora seems to treat people the same regardless if they are normal employees or contractors), but there’s quite a lot of legal challenges on my end due to this. So, this is what I’m doing now. I’m happy with my choice and I have a lot of really great colleagues! I also get to work with a huge community, and as part of that I’ll be going to more conferences going forward (next up: XDC)! Let's start with having a look at a high level overview of what the graphics stack looks like. Before digging too much further into this, lets cover some terminology. DRM - Direct Rendering Manager - is the Linux kernel graphics subsystem, which contains all of the graphics drivers and does all of the interfacing with hardware. The DRM subsystem implements the KMS - kernel mode setting - API. Mode setting is essentially configuring output settings like resolution for the displays that are being used. And doing it using the kernel means that userspace doesn't need access to setting these things directly. The DRM subsystem talks to the hardware and Mesa is used by applications through the APIs it implements. APIs like OpenGL, OpenGL ES, Vulkan, etc. All of Mesa is built ontop of DRM and libdrm. libdrm is a userspace library that wraps the DRM subsystem in order to simplify talking to drivers and avoiding common bugs in every user of DRM. Looking inside Mesa we find the Gallium driver framework. It is what most of the Mesa drivers are built using, with the Intel i965 driver being the major exception. kms_swrast is built using Gallium, with the intention of re-using as much of the infrastructure provided by Gallium and KMS as possible instead. kms_swrast itself is backed by a backend, like softpipe or the faster llvmpipe, which actually implements the 3D primitives and functionality needed in order to reach OpenGL and OpenGL ES compliance. Softpipe is the older and less complicated of the two implementations, whereas is llvmpipe is newer and relies on LLVM as an external dependency. But as a result llvmpipe support JIT-compilation for example, which makes it a lot faster. Re-using the Gallium framework gives you a lot of things for free. And the driver can remain relatively lightweight. Apart from the features that Gallium provides today, you'll also get free access to new features in the future, without having to write them yourself. And since Gallium is shared between many drivers, it will be better tested and have fewer bugs than any one driver. kms_swrast is built using DRM and actual kernel drivers, but no rendering hardware is actually used. Which may seem a bit odd. So why are the kernel drivers used for a software renderer? The answer is two-fold. It is what Gallium expects, and there is a kernel driver called VGEM (Virtual GEM) which was created specifically for this usecase. In order to not have to make invasive changes to it or make the switch to VGEM right away, just providing it with access to some driver is the simplest possible solution. Since the actual hardware is mostly unused, it doesn't really matter what hardware you use. The DRM driver is actually only used for a single thing, to allocate a slice of memory which can be used to render pixels to and then be sent to the display. This is quite a long post. The executive summary is that freedesktop.org now hosts an instance of GitLab, which is generally available and now our preferred platform for hosting going forward. We think it offers a vastly better service, and we needed to do it in order to offer the projects we host the modern workflows they have been asking for. In parallel, we’re working on making our governance, including policies, processes and decision making, much more transparent. Founded by Havoc Pennington in 2000, freedesktop.org is now old enough to vote. From the initial development of the cross-desktop XDG specs, to supporting critical infrastructure such as NetworkManager, and now as the home to open-source graphics development (the kernel DRM tree, Mesa, Wayland, X.Org, and more), it’s long been a good home to a lot of good work. We don’t provide day-to-day technical direction or enforce set rules: it’s a very loose collection of projects which we each trust to do their own thing, some with nothing in common but where they’re hosted. Unfortunately, that hosting hasn’t really grown up a lot since the turn of the millennium. Our account system was forked (and subsequently heavily hacked) from Debian’s old LDAP-based system in 2004. Everyone needing direct Git commit access to projects, or the ability to upload to web space, has to file a bug in Bugzilla, where after a trip through the project maintainer, eventually an admin will get around to pulling their SSH and GPG (!) keys and adding an account by hand. Similarly, creating or reconfiguring a Git repository also requires manual admin intervention, where on request one of us will SSH into the Git server and do whatever is required. Beyond Git and cgit for viewing, we provide Bugzilla for issue tracking, Mailman and Patchwork for code review and discussion, and ikiwiki for tracking. For our sins, we also have an FTP server running somewhere. None of these services are really integrated with each other; separate accounts and separate sets of permissions are required. Maintaining these disparate services is a burden on both admins and projects. Projects are frequently blocked on admins adding users and changing their SSH keys, changing Git hooks, adding people to Patchwork, manually applying more duct tape to the integration between these services, and fixing the duct tape when it breaks (which is surprisingly often). As a volunteer admin for the service, doing these kinds of things is not exactly the reason we get out of bed in the morning; it also consumes so much time treading water that we haven’t been able to enable new features and workflows for the projects we host. As of writing, around one third of the non-dormant projects on fd.o have at some point migrated their development elsewhere; mostly to GitHub. Sometimes this was because the other sites were a more natural home (e.g. to sibling projects), and sometimes just because they offered a better workflow (integration between issue tracking and commits, web-based code review, etc). Other projects which would have found fd.o a natural home have gone straight to hosting externally, though they may use some of our services - particularly mailing lists. Not everyone wants to make use of these features, and not everyone will. For example, the kernel might well never move away from email for issue tracking and code review. But the evidence shows us that many others do want to, and our platform will be a non-starter for them unless we provide the services they want. A bit over three years ago, I set up an instance of Phabricator at Collabora to replace our mix of Bugzilla, Redmine, Trac, and JIRA. 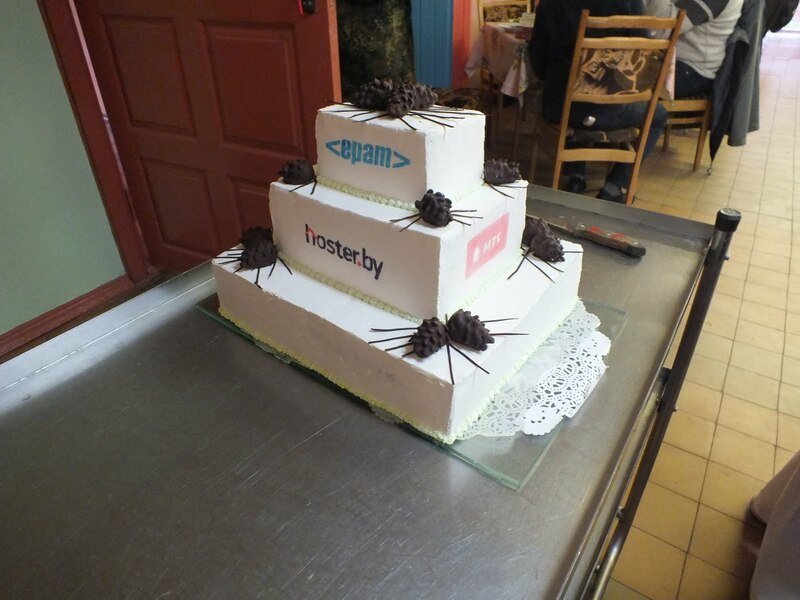 It was a great fit for how we worked internally, and upstream seemed like a good fit too; though they were laser-focused on their usecases, their extremely solid data storage and processing model made it quite easy to extend, and projects like MediaWiki, Haskell, LLVM and more were beginning to switch over to use it as their tracker. I set up an instance on fd.o, and we started to use it for a couple of trial projects: some issue tracking and code review for Wayland and Weston, development of PiTiVi, and so on. The first point we seriously discussed it more widely was at XDC 2016 in Helsinki, where Eric Anholt gave a talk about our broken infrastructure, cleverly disguised as something about test suites. It became clear that we had wide interest in and support for better infrastructure, though with some reservation about particular workflows. There was quite a bit of hallway discussion afterwards, as Eric and Adam Jackson in particular tried out Phabricator and gave some really good feedback on its usability. At that point, it was clear that some fairly major UI changes were required to make it usable for our needs, especially for drive-by contributors and new users. Last year, GNOME went through a similar process. With Carlos and some of the other members being more familiar with GitLab, myself and Emmanuele Bassi made the case for using Phabricator, based on our experiences with it at Collabora and Endless respectively. At the time, our view was that whilst GitLab’s code review was better, the issue tracking (being much like GitHub’s) would not really scale to our needs. This was mostly based on having last evaluated GitLab during the 8.x series; whilst the discussions were going on, GitLab were making giant strides in issue tracking throughout 9.x. With GitLab coming up to par on issue tracking, both Emmanuele and I ended up fully supporting GNOME’s decision to base their infrastructure on GitLab. The UI changes required to Phabricator were not really tractable for the resources we had, the code review was and will always be fundamentally unsuitable being based around the Subversion-like model of reviewing large branches in one go, and upstream were also beginning to move to a much more closed community model. By contrast, one of the things which really impressed us about GitLab was how openly they worked, and how open they were to collaboration. Early on in GNOME’s journey to GitLab, they dropped their old CLA to replace it with a DCO, and Eliran Mesika from GitLab’s partnership team came to GUADEC to listen and understand how GNOME worked and what they needed from GitLab. Unfortunately this was too early in the process for us, but Robert McQueen later introduced us, and Eliran and I started talking about how they could help freedesktop.org. One of our bigger issues was infrastructure. Not only were our services getting long in the tooth, but so were the machines they ran on. In order to stand up a large new service, we’d need new physical machines, but a fleet of new machines was beyond the admin time we had. It also didn’t solve issues such as everyone’s favourite: half of Europe can’t route to fd.o for half an hour most mornings due to obscure network issues with our host we’ve had no success diagnosing or fixing. They have also offered us support, from helping a cloud idiot understand how to deploy and maintain services on Kubernetes, to taking the time to listen and understand our workflows and improve GitLab for our uses. Much of the fruit of this is already visible in GitLab through feedback from us and GNOME, though there is always more to come. In particular, one area we’re looking at is integration with mailing lists and placing tags in commit messages, so developers used to mail-based workflows can continue to consume the firehose through email, rather than being required to use the web UI for everything. Last Christmas, we gave ourselves the present of standing up gitlab.freedesktop.org on GCP, and set about gradually making it usable and maintainable for our projects. Our first hosted project was Panfrost, who were running on either non-free services or non-collaborative hosted services. We wanted to help them out by getting them on to fd.o, but they didn’t want to use the services we had at the time, and we didn’t want to add new projects to those services anyway. Over time, as we stabilised the deployment and fleshed out the feature set, we added a few smaller projects, who understood the experimental nature and gave us space to make some mistakes, have some down time, and helped us smooth out the rough edges. Some of the blocker here was migrating bugs: though we reused GNOME’s bztogl script, we needed some adjustments for our different setups, as well as various bugfixes. Not long ago, we migrated Mesa’s repository hosting as well as Wayland and Weston for both repository tracking and issue tracking which are our biggest projects to date. With GitLab, we offer everything you would expect from gitlab.com (their hosted offering), or everything you would expect from GitHub with the usual external services such as Travis CI. This includes issue tracking integrated with repository management (close issues by pushing), merge requests with online review and merge, a comprehensive CI suite with shared runners available to all, custom sites built with whatever toolchain you like, external web hooks to integrate with other services, and a well-documented stable API which allows you to use external clients like git lab. In theory, we’ve always provided most of the above services. Most of these - if you ignore the lack of integration between them - were more or less fine for projects running their own standalone infrastructure. But they didn’t scale to something like fd.o, where we have a very disparate family of projects sharing little in common, least of all common infrastructure and practices. For example, we did have a Jenkins deployment for a while, but it became very clear very early that this did not scale out to fd.o: it was impossible for us to empower projects to run their own CI without fatally compromising security. Anyone familiar with the long wait for an admin to add an account or change an SSH key will be relieved to hear that this is no longer. Anyone can make an account on our GitLab instance using an email address and password, or with trusted external identity providers (currently Google, gitlab.com, GitHub, or Twitter) rather than having another username and password. We delegate permission management to project owners: if you want to give someone commit rights to your project, go right ahead. No need to wait for us. We also support such incredible leading-edge security features as two-factor TOTP authentication for your account, Recaptcha to protect against spammers, and ways of deleting spam which don’t involve an admin sighing into a SQL console for half an hour, trying to not accidentally delete all the content. Having an integrated CI system allows our projects to run test pipelines on merge requests, giving people fast feedback about any required changes without human intervention, and making sure distcheck works all the time, rather than just the week before release. We can capture and store logs, binaries and more as artifacts. The same powerful system is also the engine for GitLab Pages: you can use static site generators like Jekyll and Hugo, or have a very spartan, hand-written site but also host auto-generated documentation. The choice is yours: running everything in (largely) isolated containers means that you can again do whatever you like with your own sites, without having to ask admins to set up some duct-taped triggers from Git repositories, then ask them to fix it when they’ve upgraded Python and everything has mysteriously stopped working. Now that we have a decent and battle-tested service to offer, we can look to what this means for our other services. Phabricator will be decommissioned immediately; a read-only archive will be taken of public issues and code reviews and maintained as static pages forever, and a database dump will also be kept. But we do not plan to bring this service back, as all the projects using it have already migrated away from it. Similarly, Jenkins has already been decommissioned and deactivated some time ago. Whilst we are encouraging projects to migrate their issue tracking away from Bugzilla and helping those who do, we realise a lot of projects have built their workflows around Bugzilla. We will continue to maintain our Bugzilla installation and support existing projects with its use, though we are not offering Bugzilla to new projects anymore, and over the long term would like to see Bugzilla eventually retired. Patchwork (already currently maintained by Intel for their KMS and Mesa work) is in the same boat, complicated by the fact that the kernel might never move away from patches carved into stone tablets. Hopefully it goes without saying that our mailing lists are going to be long-lived, even if better issue tracking and code review does mean they’re a little less-trafficked than before. Perhaps most importantly, we have anongit and cgit. anongit is not provided by GitLab, as they rightly prefer to serve repositories over https. Given that, for all existing projects we are maintaining anongit.fd.o as a read-only mirror of GitLab; there are far too many distributions, build scripts, and users out there with anongit URIs to discontinue the service. Over time we will encourage these downstreams to move to HTTPS to lessen the pressure, but this will continue to live for quite some time. Having cgit live alongside anongit is fairly painless, so we will keep it running whilst it isn’t a burden. Lastly, annarchy.fd.o (aka people.fd.o) is currently offered as a general-purpose shell host. People use this to manage their Git repositories on people.fd.o and their files publicly served there. Since it is also the primary web host for most projects, both people and scripts use it to deploy files to sites. Some people use it for random personal file storage, to run various scripts and even as a personal IRC host. We are trying to transition these people away from using annarchy for this, as it is difficult for us to provide totally arbitrary resources to everyone who has at one point had an account with one of our member projects. Running a source of lots of IRC traffic is also a good way to make yourself deeply unpopular with many hosts. After being iterated and fleshed out, we are happy to offer to migrate all the projects. For each project, we will ask you to file an issue using the migration template. This gives you a checklist with all the information we need to migrate your GitLab repositories, as well as your existing Bugzilla bugs. Every user with a freedesktop.org SSH account already has an account created for them on GitLab, with access to the same groups. In order to recover access to the migrated accounts, you can request a password-reset link by entering the email address you signed up with into the ‘forgotten password’ box on the GitLab front page. More information is available on the freedesktop GitLab wiki, and of course the admins are happy to help if you have any problems with this. The usual failure mode is that your email address has changed since you signed up: we’ve had one user who needed it changed as they were still using a Yahoo! mail address. Away from technical issues, we’re also looking to inject a lot more transparency into our processes. For instance, why do we host kernel graphics development, but not new filesystems? What do we look for (both good and bad), and why is that? What is freedesktop.org even for, and who is it serving? This has just been folk knowledge for some time; passed on by oral legend over IRC as verbal errata to out-of-date wiki pages. Just as with technical issues, this is not healthy for anyone: it’s more difficult for people to get involved and give us the help we so clearly need, it’s more difficult for our community to find out what they can expect from us and how we can help them, and it’s impossible for anyone to measure how good a job we’re actually doing. One of the reasons we haven’t done a great job at this is because just keeping the Rube Goldberg machine of our infrastructure running exhausts basically all the time we have to deal with fd.o. The time we spend changing someone’s SSH keys by hand, or debugging a Git post-receive hook, is time we’re not spending on the care and feeding of our community. We’ve spent the past couple of years paying down our technical debt, and the community equivalent thereof. Our infrastructure is much less error-prone than it was: we’ve gone from fighting fires to being able to prepare the new GitLab infrastructure and spend time shepherding projects through it. Now that we have a fair few projects on GitLab and they’ve been able to serve themselves, we’ve been able to take some time for community issues. Writing down our processes is still a work in progress, but something we’ve made a little more headway on is governance. Currently fd.o’s governance is myself, Keith and Tollef discussing things and coming to some kind of conclusion. Sometimes that’s in recorded public fora, sometimes over email with searchable archives, sometimes just over IRC message or verbally with no public record of what happened. Given that there’s a huge overlap between our mission and that of the X.Org Foundation (which is a lot more than just X11! ), one idea we’re exploring is to bring fd.o under the Foundation’s oversight, with clear responsibility, accountability, and delegated roles. The combination of the two should give our community much more insight into what we’re doing and why - as well as, crucially, the chance to influence it. Of course, this is all conditional on fd.o speaking to our member projects, and the Foundation speaking to its individual members, and getting wide agreement. There will be a lot of tuning required - not least, the Foundation’s bylaws would need a change which needs a formal vote from the membership - but this at least seems like a promising avenue.